Located just a few miles north of Cashiers lies the crystal clear waters of beautiful Lake Glenville. Each summer, thousands of people vacation along its 26 miles of sandy shorelines and enjoy the beautiful waterfalls which feed into the lake. Lake Glenville encompasses 1.435 acres and is situated along the Continental Divide with the highest elevation for a man-made lake this side of the Mississippi River. Several large streams feed the lake with water, including Hurricane Creek, Mill Creek, Cedar Creek, Norton Creek and Pine Creek. Originally named Thorpe Reservoir, Lake Glenville generated power in World War II to support aluminum production for the war effort. The project began service in October 1941 and is now regulated by Duke Energy. 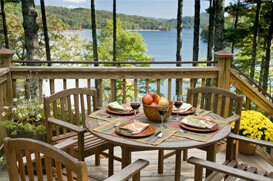 Gorgeous Lake Glenville is home to numerous lakefront and lakeview communities. Such neighborhoods include Buck Knob Island, Fenley Forest Trail, Bright Mountain, Glen Point, Summer Cove, Summer Hill, Admiral’s Point, Glen Laurel, Glenville Lake Estates, Buck Knob Landings, The Lake Club, Stillpoint, Tahala Shores and Strawberry Hill. Each community has its own unique characteristics and sense of individuality. In the summertime both local homeowners and seasonal visitors enjoy fishing, boating, and swimming in the serene peaceful setting.